An electric car model has topped the list of new car registrations in Norway for the first time, a car industry group said Thursday. 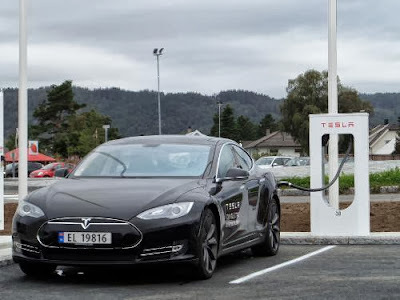 In the month of September there were 616 registrations of the Tesla Model S, accounting for 5.1 percent of the total, according to Opplysningsraadet for Veitrafikken(OFV) which compiles data on Norwegian car sales. Overall, electric cars took 8.6 percent of the market in September, compared to 5.2 percent a year ago. The figures illustrate strong interest in electric cars in a country ranked among the world's top ten petrol exporters. Norway has encouraged electric car sales with tax incentives, congestion charge exemptions, access to public transport lanes and free parking. "I have no doubt that electric cars will increase their share of the market again in the coming months, and particularly next year with the arrival of several new models,"said Oeyvind Solberg Thorsen at OFV. In September hybrid cars, which do not enjoy the same incentives as electric vehicles, took 7.3 percent of the market.